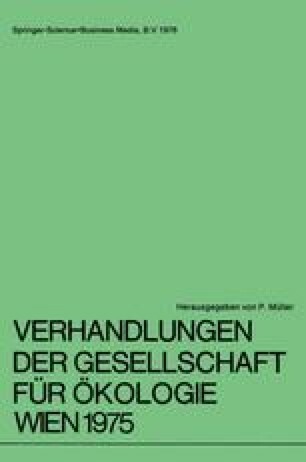 Mit Unterstützung der Deutschen Forschungsgemeinschaft. Den Mitarbeitern A. SCHÄFER, M. GÖKCEOGLU, E. HOERNER, K. KÜHNER, M. OLBRICH, V. SCHACHT & A. HOLZMAYR sei auch an dieser Stelle für ihren Einsatz gedankt. A plot of the typical alpine meadow community of the Northern Calcareous Alps, the Cariceturn firmae (Altitude 2160m), was investigated with regard to its mean dry substance (TS) values and changes during the growing season (VP) and to its main nutrient (N-, P- and K-) relations. The annual overground („green mass“) production is about 100 g TS/m2. The accumulation of litter in relation to the annual green mass production is nearly 30:1. The mean underground phytomas („root mass”) is more than 6:1 in relation to the maximal green mass. The underground/overground relation of the N-content in the phytomass, however, as well as that of the P-content, is about 4:1. The net mineralization of N, obtained from field incubation tests for the VP (2 g/m2) is higher than the annual increase of N in the green mass (1 g/m2) but less than the root mass increase (7 g/m2). The increase of P also is small in the green mass (0.07 g/m2) and high in the root mass (0.35 g/m2). The fluctuation of the lactate soluble P-content in the soil during the VP (decrease from begin to the mid of VP) also amounts 0.35 g/m2. The K-relations are similar: 0.6 g/m2 increase in the green mass and 3 g/m2 in the root mass. But the fluctuation (decrease as above) of K in the soil is only 0.5 g/m2. On the whole we find this ecosystem to present a small overground productivity with slow leaf decomposition, but elevated annual underground innovation rates and hence a higher turnover in the root sphere. This habitat is compared with another plot of the same plant community and with three other meadow communities of the same region (1900–2150 m). The second plot of the Caricetum firmae is similar to the first one in its essential aspects. It ranks, like the first one, lower in production and nutrient relations, but higher in litter accumulation, than the three other communities. The alpine meadows investigated here rank between the „typical arctic tundra“ and the„dwarf shrub tundra” with regard to phytomass relations. But the primary production is higher than in both tundra types.